Apart from their flagship operating system, Ubuntu One is one of the best products from the UK-based Canonical Ltd. A cloud service designed for end users, this free tool has been one of the main selling points for the open-source operating system. Ubuntu One is offered across most of the popular OS platforms except Mac OS X and has been regarded as an upcoming competitor to the ever-popular Dropbox. Ubuntu One allows its users to upload all their files to the cloud. If you download any music from the Ubuntu One Music Store, it will automatically get stored to your cloud-based account. Users start with 5GB of storage space that can be further increased by purchasing paid plans. The data that is uploaded to the server is stored on Amazon S3 servers, thus ensuring a high amount of reliability and availability. Furthermore, one of the best things about this service is that it integrates very tightly with the operating system, which also is one of its biggest selling points. Thus, there is very little doubt how useful Ubuntu One is; however, many users still fail to see some of the amazing features that it offers. If you’re one of them, don’t worry, as we are going to list some great tricks that will make Ubuntu One much more than a file syncing utility for you. First, go to https://one.ubuntu.com and open your files. Choose the file you want to share with your friends. If you don’t see it there, make sure you have added the folder to which the file belongs to your Personal Folders. Then once you spot the file, look to the right. There, you’ll see a down arrow with ‘More’ written on it. Click on it, and the menu will expand to give you two options: Publish file and Download file. Click on ‘Publish File’ and you’ll get a shortlink that you can share easily with your friends. If you use Tomboy Notes, it can be integrated easily with Ubuntu One so that all your notes are backed up safely to the cloud. Also, every time you’ll format your computer and install a fresh copy of Tomboy, you can easily access all your notes by simply entering your Ubuntu One details. To get started, open Tomboy. Then, go to preferences and click on the Synchronization tab. Enable synchronization and then connect your Ubuntu One account to Tomboy. Once you’re done, all your notes will automatically get synced to the cloud. 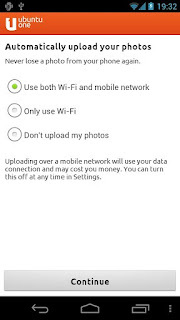 The Ubuntu One mobile app comes with a great feature that lets you upload your photos to the cloud automatically. This means that every time you take a new pic, it gets uploaded to the cloud instantly. To enable this feature, simply install the Ubuntu One application from the Google Play Store. During setup, you’ll be asked if you want to upload your photos to the cloud. If the 5GB offering isn’t enough for you, you can increase it by making your friends switch to Ubuntu One. If you refer your friends and family to Ubuntu One, you and them both get 500MB extra space. Sign up to Ubuntu One using this link and you’ll get an extra 500 MB. Like that, you can get up to 20GB of storage space. If you use Ubuntu One on a daily basis and are always uploading large amount of files to the cloud, the download and upload can affect your Internet browsing speed sometimes. To avoid this, simply put a cap on the speed at which Ubuntu One downloads or uploads the files. To do that, open Ubuntu One application, and then click on ‘Settings’. 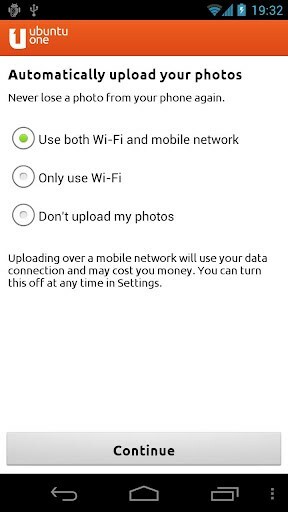 There you’ll see options wherein you can change the bandwidth settings. It’s not a good idea to put a cap on the bandwidth if you want your files uploaded instantly. A good article but you don't mention anything about privacy concerns or security; as it relates to putting personal material up onto the U-One cloud. Perhaps you could consider that for next time. Cheers.